You can find treatment programs through the website www.findtreatment.samhsa.gov provided by the Substance Abuse and Mental Health Services Administration (SAMHSA). You can also call the SAMHSA Treatment Referral hotline at 1-800-662-HELP. Treatment can help you, a friend, or someone you love get back to the person you or they once were. The NIDA website drugabuse.gov has information on a variety of drugs and related topics. NIDA's teen site https://teens.drugabuse.gov has free downloads, entertaining and informative videos and games, and a blog for teens, where you can leave us a comment or two. Get the scoop on how different drugs affect the brain and body, and read real stories from teens who have struggled with drug use and addiction. The NIAAA website http://www.niaaa.nih.gov contains the latest research, news, and other resources related to alcohol. NIAAA even has a site especially for young teens called “the cool spot,” www.thecoolspot.gov, with quizzes and other interactive resources that give you information on alcohol and resisting peer pressure. To learn more about mental health disorders like depression or schizophrenia, visit the NIMH website at http://www.nimh.nih.gov and read the Director's Blog on various topics that include suicide prevention, bipolar and borderline personality disorders, coping with traumatic events, and more. NIDA. "Marijuana: Facts for Teens." 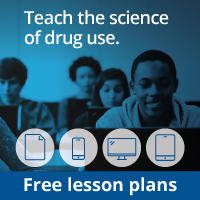 National Institute on Drug Abuse, 25 Dec. 2017, https://www.drugabuse.gov/publications/marijuana-facts-teens. NIDA. Marijuana: Facts for Teens. National Institute on Drug Abuse website. https://www.drugabuse.gov/publications/marijuana-facts-teens. December 25, 2017.